Zoey, a seven year old ‘dock dog’ leaps more than 20 feet chasing a float toy thrown by owner Stephanie Prock of Canel Fulton, Ohio. Zoey was just one of the dozens of dogs of all breeds competing for trophies at this weekend’s ‘Cherokee Dock Warriors’ canine sporting event. The two day event is produced by Carolina Dock Dogs as part of the 11th annual Talking Trees Children’s Trout Derby. 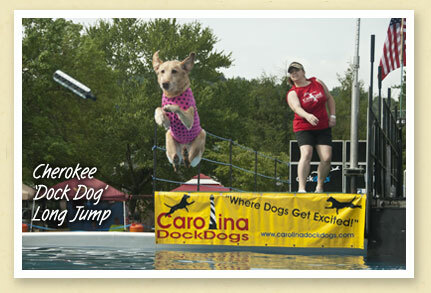 Dockdogs is a fast growing dock jumping and dock diving sport for dogs that’s been featured on ESPN and The Outdoor Channel. The sport is comprised of the three disciplines: ‘Big Air’ (long jump); ‘Extreme Vertical’ (high jump); Speed Retrieve (jump, swim and retrieve); and ‘Iron Dog’, when a dog competes in all three disciplines. By consistently jumping 22 foot distances Zoey is considered a ‘master’ in the Big Air event.